This recipe should make about 36 wontons. 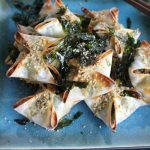 The beauty of wontons is that you can put whatever you want inside. Feel free to mix together any of the veggies below and enjoy! Add the sesame oil to a large wok or non-stick pan over medium-high heat. Wait minute or two for the pan and oil to heat up, and then add your veggies + garlic and mix. After a minute or two, season with salt, pepper and the soy sauce. Taste and add more soy sauce if needed. Cook until the vegetables become soft; for about 5-8 more minutes. Sprinkle on some sesame seeds and crushed red pepper if desired, toss and set aside. To assemble the wontons: Have a small bowl of water close by. Fill one wonton skin wrap with about a tablespoon of the veggie filling and dip your finger in the water and wet one corner of your wonton skin wrap, fold over and connect with the opposite corner. Press together firmly. Wet the remaining corners and connect/tuck in the left and right corners to the center. Press together firmly again. This should create the "pillow" shape automatically. Repeat with remaining wonton wrappers. Brush with the egg wash and sprinkle on sesame seeds and bake for 8 minutes or until golden brown. Remove from the oven and allow to cool slightly before garnishing with more roasted sesame seeds and the dried seaweed (gim). Serve with dipping sauce.